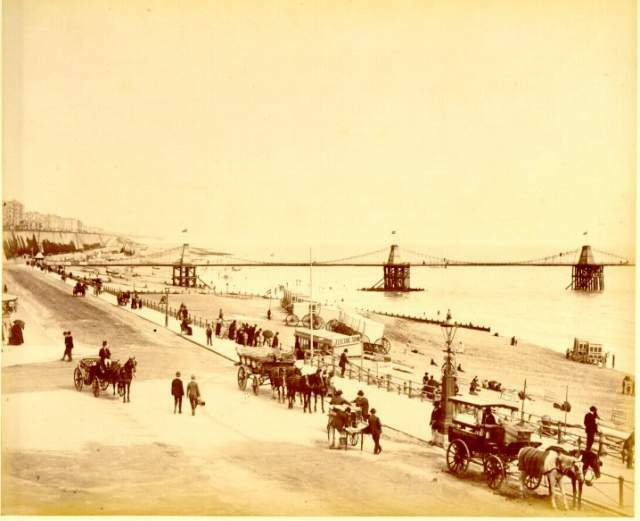 Promenade near Chain Pier, c. 1890: A busy scene on the beach near the Chain Pier, with bathing machines and electric tram on the beach. 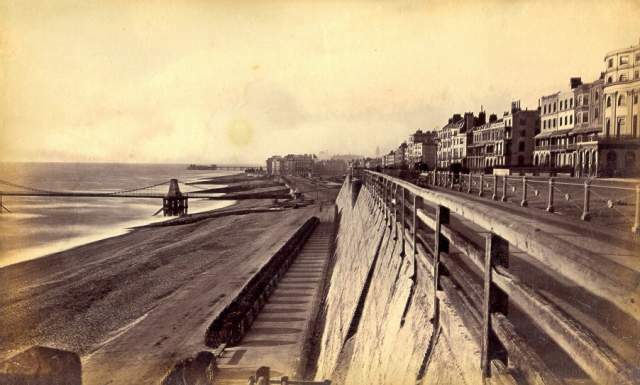 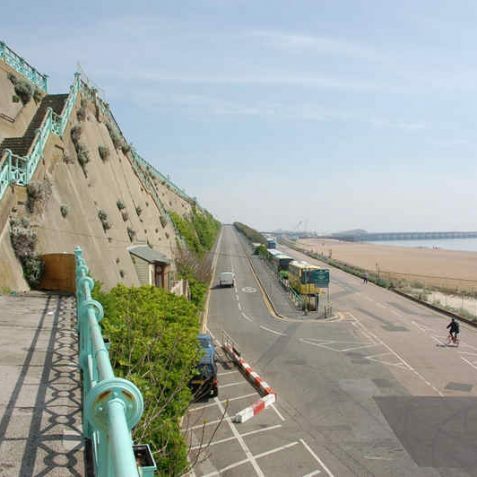 a) HISTORY: The first road along the base of the East Cliff was the carriage road constructed on top of a new sea-wall to the Chain Pier in 1822-3. 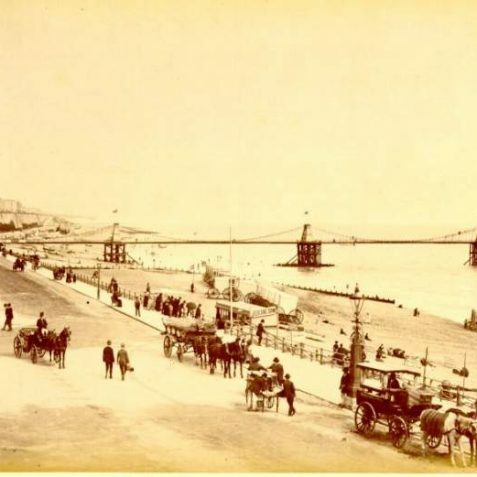 In 1872 however, the Aquarium was erected on the site of this road, and a new promenade and carriage drive from the Old Steine were constructed on a new sea-wall. 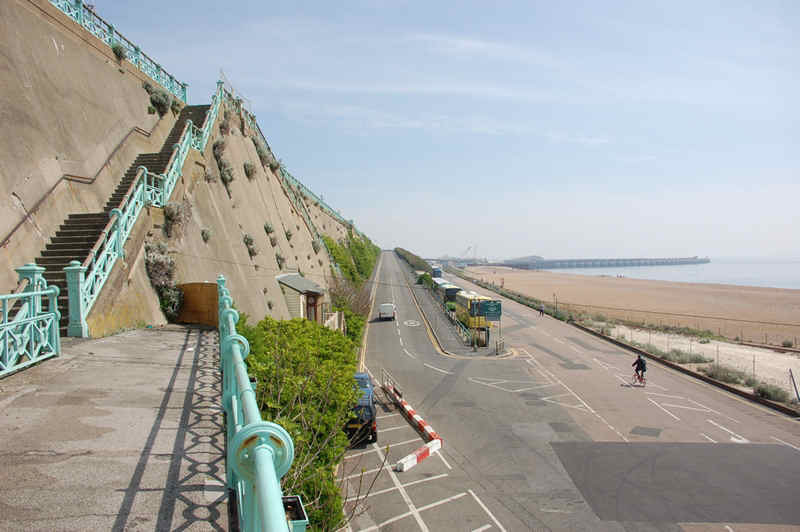 The new road, known as Madeira Road until the First World War, continued past the Chain Pier and up a ramp to meet Marine Parade at the Duke’s Mound. 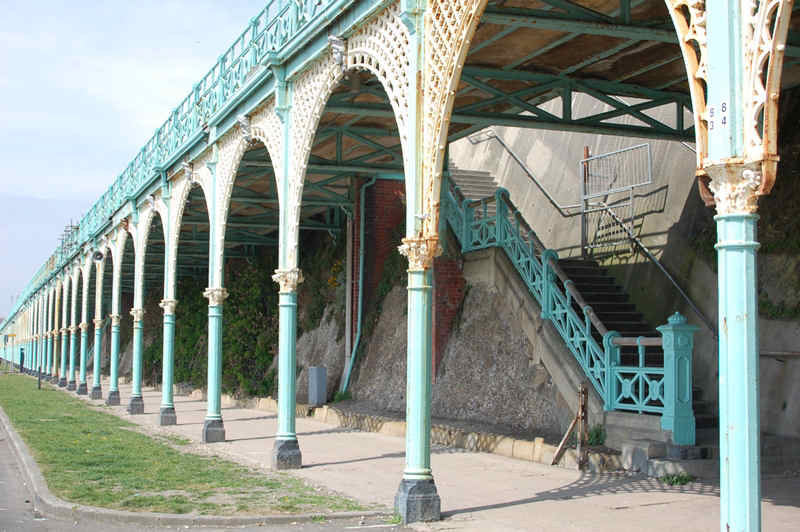 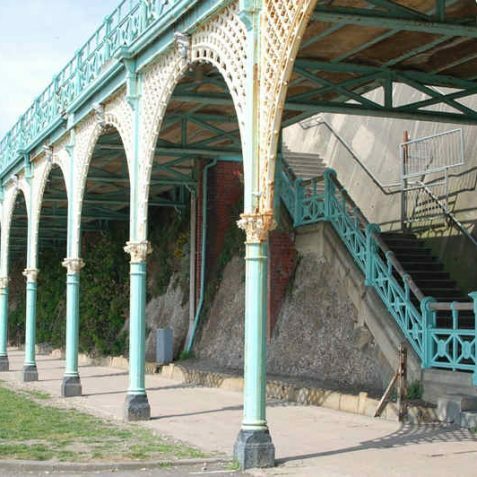 With its sheltered situation it quickly became a popular promenade with visitors, especially invalids, and improvements were made in 1890-7 with the addition of the Madeira Terrace (see below). 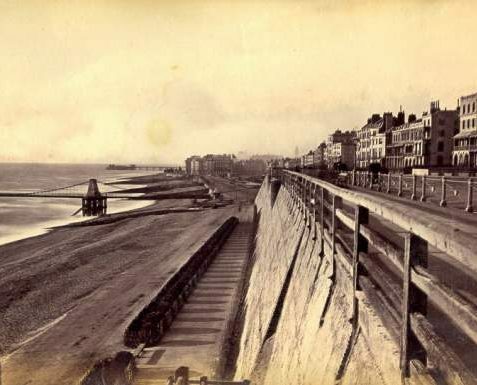 In 1895 the roadway was extended past the Kemp Town slopes and esplanades to meet Marine Parade at Black Rock, but this section has been a ‘no through road’ since the construction of the Marina interchange in the 1970s. 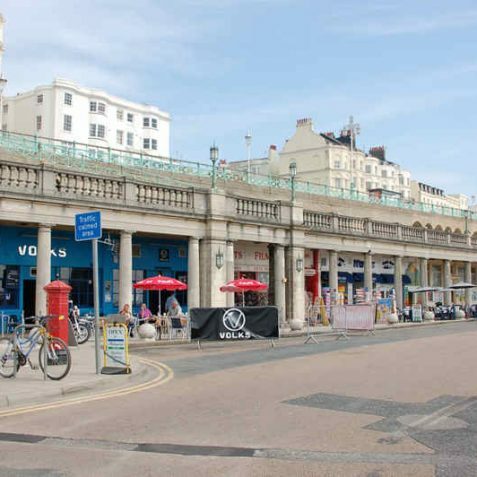 In 1927-9 the Aquarium Sun Terrace was extended eastwards above a new colonnade of shops in Madeira Drive, while the western end of the road was widened in 1929-30 by extending the promenade seawards over a colonnade on the Lower Esplanade, an improvement inaugurated by the mayor, Horace Aldrich, on 27 June 1930. 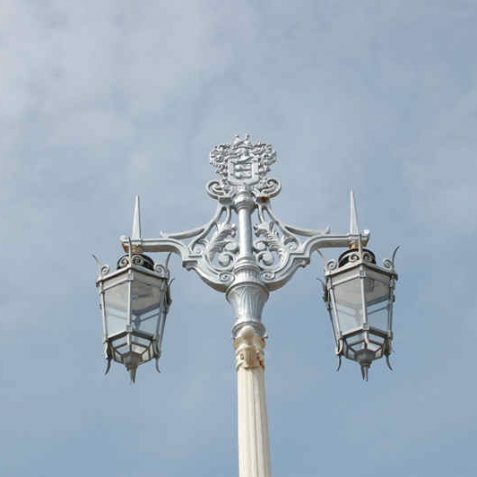 The distinctive lamp-standards date originally from the 1930s. 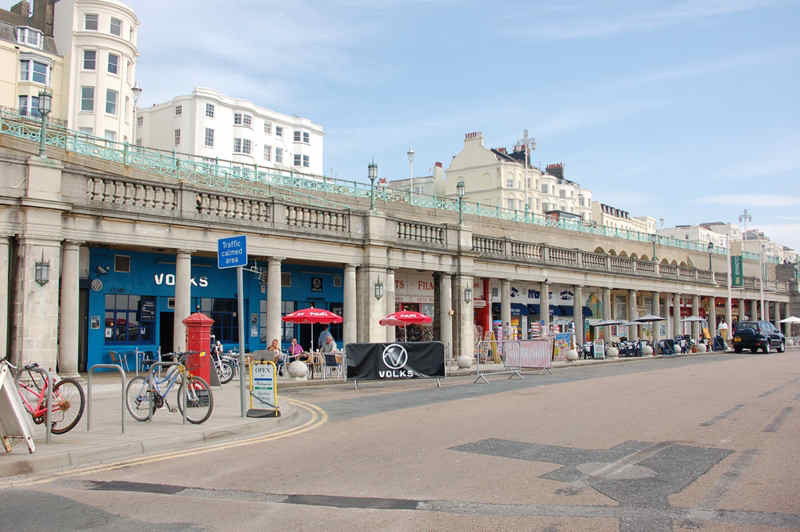 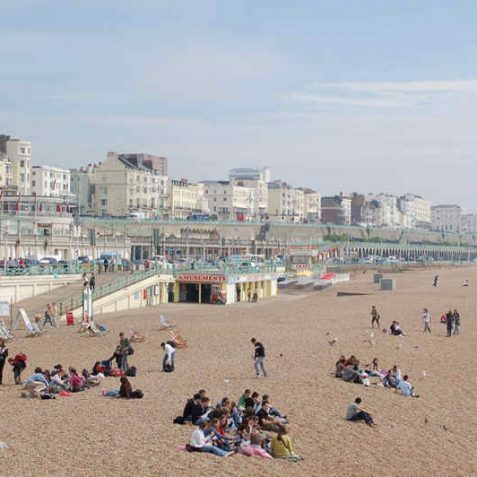 Once the terminus for Southdown buses and coaches, Madeira Drive is still lined with coaches on sunny Sundays, and has overtaken the King’s Road as the principal sea-front promenade. 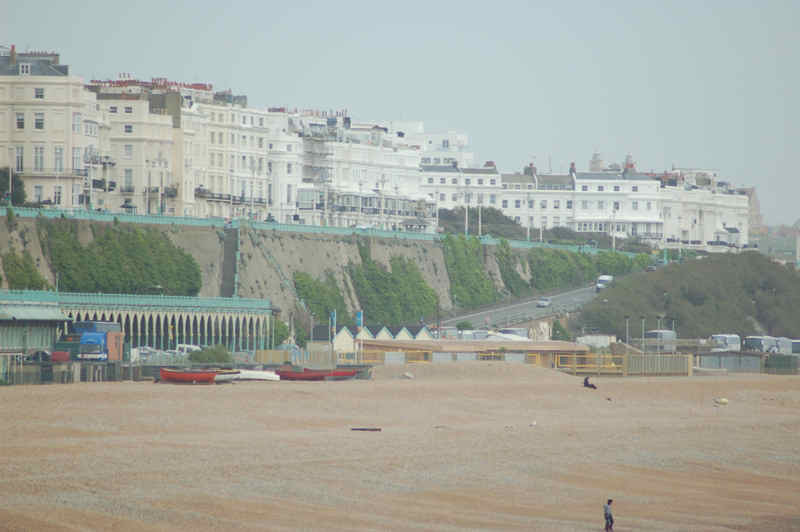 One of the finest features of Madeira Drive is the plants that form a ‘green wall’. 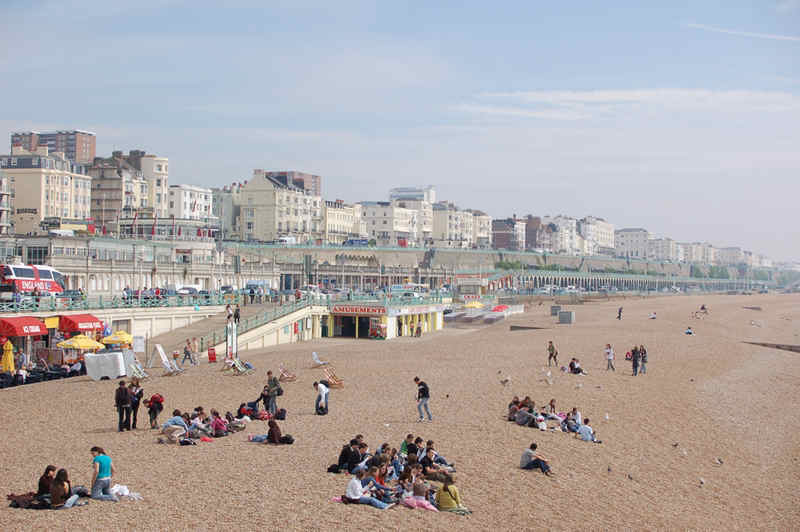 This green frontage is unique in the city, and one of the longest such walls in the country – something for the people of Brighton & Hove to be very proud of! 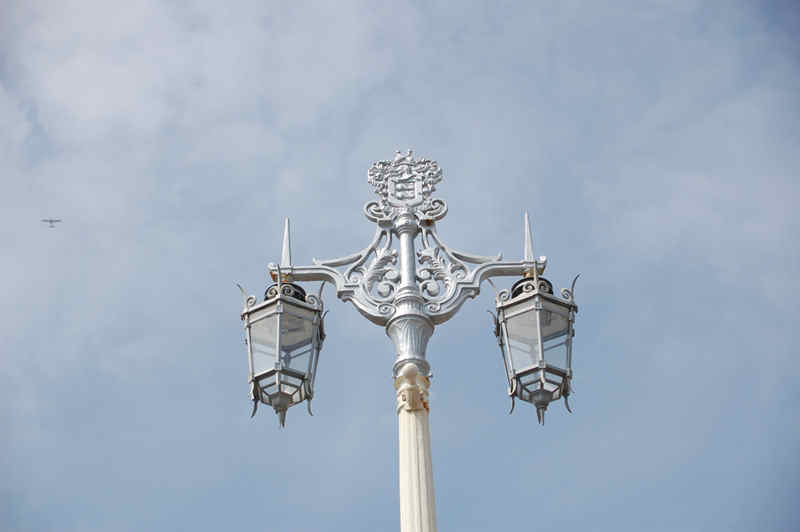 The planting is Edwardian in origin, and mainly consists of an evergreen plant called Japanese spindle along with ivy. 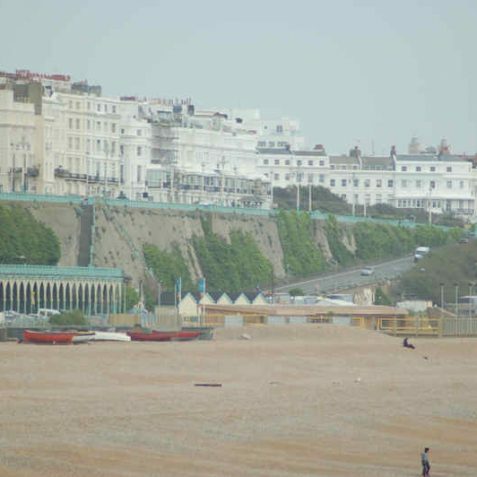 The plants may well be protecting the render on the cliff face from the elements – where ivy has been stripped from the brick work on the Esplanade, you can clearly see that it was protecting the mortar.